Start with blind baking the puff pastry. Roll out the puff pastry (I used an already bought one) onto the baking parchment and fit it into a round baking tray of 26cm in diameter. There should be some extra pastry around the margins of the tray that are best to fold gently, creating a nice little edge which will protect the almond paste from leaking out. Prick the pastry with a fork and bake in the preheated oven to 180 C (temperature for a non fan assisted oven, otherwise set the temperature to 170 C) for around 10 minutes. The pastry should get a light golden colour. Set aside and wait until it cools down. Prepare the almond filling (called frangipane) by mixing very well the almond flour with softened butter, sugar and one egg. Spread it evenly onto the puff pastry within its borders. Arrange the apricot halves with their cut side up. Scatter rosemary on top as in the picture and sprinkle with extra icing sugar. Bake for 35-40 minutes at 180 C.
Wait until it cools down before serving. 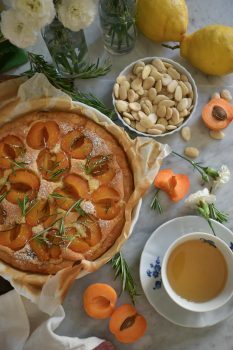 The pastry should be dry thanks to the blind baking, the frangipane lovely and creamy, apricots tender but still keeping their shape.